Today's Nice Price or Crack Pipe Corvette gives you more top options than a Bras Я Us, and it has a four-speed to boot. Will its price however top your list of this week's deals? Geez, speaking of this week, it's been like the Crackocalypse so far with nothing even coming close to passing muster. Yesterday was no exception as even though our custom 500 SEC candidate was fitted with gull wing doors, fully 70% of you felt paying its price would be a bird-brained move. Maybe it's the holiday stress finally getting to us all? 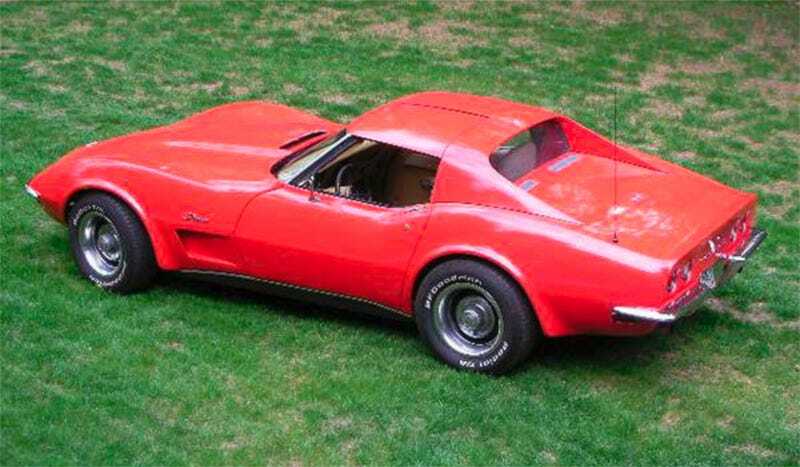 If that's the case, then take a rest from the carousel of consumerism and have a look at this hugely fascinating 1971 Chevy Corvette Stingray. Looks pretty good huh? Okay, now look closer. Closer... whaaaa? Yup, that T-top roof, along with its iconic flying buttresses, is totally removable. That gives the car the advantages of a top-down convertible without all the sissy-boy peace of mind that carrying your weather protection with you brings. Other mods that the car carries and that may not be so immediately noticed are later C3 side vents in the fender and corresponding hood. Those are wrapped around what's described as a crate 350. Yep, if you demand originality in your Corvette and numbers that match like Garanimals®, then you should probably just move along, nothing to see here. If you're like me however, and appreciate clever and well done mods then hang around and lets dive into this plastic fantastic a little bit deeper. The ad notes that the seller has owned the car for 25 years, and for that time has kept it completely in the dark about winter. The paint (little red Corvette!) looks okay in the pics and aside from a grille at the trailing edge of the replacement hood, it looks to have all its trim. The seller chose not to include any shots of the interior, but from the 'some assembly required' exterior shot it appears to be beige. The ad does cryptically note that it could use some restoration. There's no real detail either on how the Rubic's Cube top all fits securely to the body, or even how and why it was created. It does seem however to be able to come apart and go back together so perhaps that's a gimme. Mechanically there is that crate V8, which is topped by a 4bbl that appears to be inexplicably wrapped in aluminum foil. What's up with that, vapor lock? Hell, are half of you even old enough to know what vapor lock is? Hello? What, is Sponge Bob on? Sorry, I lost my train of thought again. The 350 was the smaller of the two eights available in '71 - the larger being the massive 454 - and this crate SBC is matched to a close ratio Muncie four-speed for all your rowing pleasure. This is a very odd car, it's really good looking, has that neat top, and is mechanically kitted in a manner that we generally love. It's also a mishmash of C3 styling tropes, and again, there's that neither fish nor fowl top that's probably a pain in the neck to remove and replace. But then there's the price. The seller says that he is moving and doesn't want the car following him to his new digs. As such, he's looking for a quick sale and has priced the car at $8,500. That'd be a pretty good deal for a numbers-matching car, but for this chimeric beast, it's up in the air. What do you think about $8,500 for this one of a kind Corvette, is that a deal? 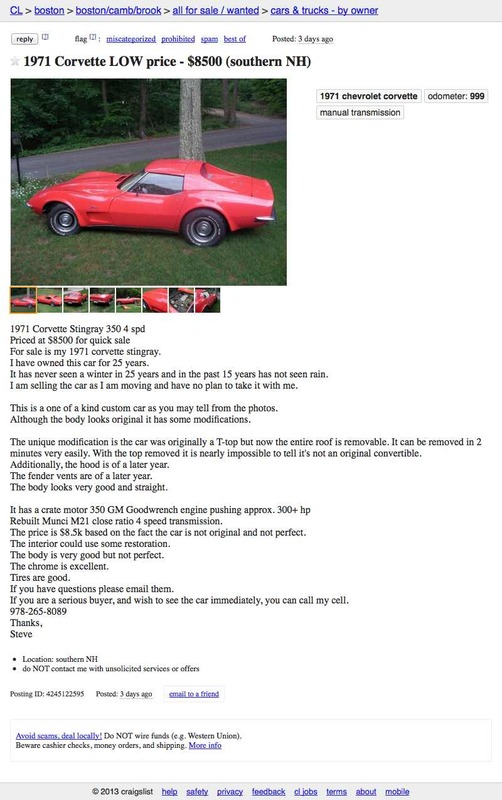 Or, for that kind of cash, should this Vette be fully vetted? Bean Town Craigslist, or go here if the ad disappears.